The apostle John wrote in Revelation 1, verse 10; “I was in the spirit on the Lord’s day.” What did John mean by that? What did he mean when he said, “I was in the spirit..” ? Did John’s spirit leave his body on that day? The apostle Paul said in 2 Corinthians 12, verse 2, that he was “caught up to the third heaven”, but that he didn’t know whether he was “in the body, or out of the body”. Was John out of his body on that day? I don’t think so; There’s nothing in that verse to indicate that. You could say, that we are always “in the spirit”, simply because we are spirit. We are a spirit, temporarily housed in a physical body. Therefore, you might say that if you were deep in prayer, or deep in meditation, that you were “in the spirit”. In other words, when you’re engaged in prayer or meditation, you are exercising your “spiritual side”. Is that what John meant when he said that he was “in the spirit”? Was John saying that he happened to be deep in prayer at this particular moment? I used to think that’s what was meant here, but when we consider the wording of the verse, and the whole verse, and even the next few verses, we’ll see that’s not what is meant here..
Let’s read the whole verse, Revelation 1, verse 10; “I was in the Spirit on the Lord’s day, and I heard behind me, a loud voice, like of a trumpet.” Now let me read verse 12; “And I turned to see the voice that was speaking with me, and having turned, I saw seven golden lampstands, and in the middle of the lampstands, one like the Son of Man, clothed in a robe reaching to His feet, and girded across His breast with a golden girdle.” So John not only “heard”, but he also “saw”. John saw a vision, and he heard a voice like a trumpet. He saw a vision of Jesus Christ, and heard Christ’s words. In this verse, speaking with “other tongues” was a direct result of being “filled with the Holy Spirit”. And in Revelation 1, verse 10, seeing a vision of Jesus Christ, and hearing His words, was a direct result of being “in the Spirit”. Do you see what I’m getting at? In Acts 2, verse 4, being “filled with the Holy Spirit” was the same as being “under the control” of the Holy Spirit. And again, in Revelation 1, verse 10, being “in the Spirit” was also the same, as being “under the control” of that very same Holy Spirit. You see, in that phrase “in the Spirit”, that little word “IN” means.. “to be with, or to be within, or to be among”. Was John “among, or within” his own spirit? No, but he was “with” the Holy Spirit, and “within” the control of the Holy Spirit. And that is evidenced by the fact that John began to see a vision. The Holy Spirit, came upon the apostle John, on that Lord’s day, and caused him to see a vision of Jesus Christ, and to hear His words. Here’s an interesting note; That was the final “work” of the Holy Spirit, which has been recorded in the bible. The Holy Spirit was responsible for a lot of things happening, and recorded for us in the bible, but this was the final record, of the “work” of the Holy Spirit. What Day is “the Lord’s Day” ? Now I want to ask you; What day is the Lord’s day? Revelation 1:10 is the only verse in the bible that uses the phrase, “the Lord’s day”. But this verse doesn’t specify which day of the week that is. In a sense, every day is the Lord’s, because He creates every day that there is. But obviously, this verse is referring to a specific day. And so, how do we know for sure, which day of the week is being referred to as “the Lord’s day”? What day has enough significance, in relation to the Lord, that God would call it the Lord’s day? Ask your self this; How many days are there, that the bible specifically mentions by name, in relation to the Lord? There’s only two days mentioned by name, and there’s one more day spoken of, by implication, you might say. The two days mentioned by name are the Sabbath day, and the first day of the week. There is one more day specifically mentioned in the bible, that’s related to the first day of the week, and that day is Pentecost. Pentecost is the fiftieth day after the Passover Sabbath. You count seven more Sabbath days, which makes 49 days, plus one more day, which makes it the fiftieth day, or, the first day of the week. So then, the Sabbath is mentioned, and the first day of the week is mentioned, and the day of Pentecost is mentioned, in direct relation to the lord. And the day that you might say is implied, is Friday. Can you think of something significant, that took place on Friday, that’s related to Jesus our Lord? Well, Jesus was crucified on a Friday, that’s significant. We know that Jesus was crucified on a Friday, because the gospels of Mark, Luke, and John, all confirm that fact, even though the word “Friday” isn’t specifically mentioned. So, the “Sabbath was about to dawn”, therefore, the day Jesus was crucified was a Friday, the day before the Sabbath. Now, the crucifixion of Jesus was indeed a very significant event, and it occurred on a Friday, however the bible doesn’t mention another thing about that day. And so that by itself, wouldn’t lead us to believe that Friday could be “the Lord’s day”, even though Jesus was crucified on that day. What about the Sabbath day? Would it be reasonable to assume that the Sabbath day, is “the Lord’s day”? What things occurred on the Sabbath day, that are somehow related to the Lord Jesus? Well, to begin with, the Sabbath was the day AFTER Jesus was crucified. It was the first FULL day, that Jesus’ body laid in the tomb, and His soul was in hades. That doesn’t sound like the kind of criteria that would cause the Sabbath day, to be honored, by being called “the Lord’s day”. Think about it; The only complete day when Jesus’ body was in the tomb, and the only complete day when His soul was in hades; Would that be something to honor? The fact that Jesus laid in the tomb for that full day, actually has nothing to do with our salvation. So then would that be something that would make the Sabbath day worthy, of being called the Lord’s day? I don’t think so! So it was the “custom” of Jesus, to go to the synagogue on the Sabbath. But then, that was also the “custom”, of almost every other Jew alive. That was simply a Jewish custom. So that wasn’t anything specific to Jesus. It certainly isn’t any reason to refer to the Sabbath as “the Lord’s day”, when every other Jew did exactly the same thing. If anything, the Sabbath is the “Jew’s day”. And it actually was the Jew’s day. It was their day of rest. But then, Jesus healed everywhere He went, not just when He went to the synagogue. and I’m sure that He healed every other day of the week also. So then just because Jesus healed on the Sabbath, that wouldn’t make that day any different from any other day. And here’s what Jesus had said in Mark 2:27 & 28; “..The Sabbath was made for the sake of man, and not man for the sake of the Sabbath. Therefore, the Son of Man is Lord also of the Sabbath.” Would the fact that Jesus was “Lord of the Sabbath”, mean that the Sabbath was “the Lord’s day”? Actually, quite the contrary would be true. 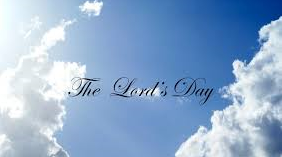 For a day to be called “the Lord’s day”, that day would need to be elevated above all the rest of the days. But the saying that Jesus is “also” Lord of the Sabbath, just like He’s Lord over everything else, is really grouping the Sabbath along with every other day. As a matter of fact, instead of elevating the Sabbath day, to be “the Lord’s day”, that verse elevates the Lord, above the Sabbath! And also, by Jesus’ own words, “the Sabbath was made for the sake of man”. That was the purpose for it. It wasn’t made to be “the Lord’s day”. It was made for the SAKE of man, and the Son of Man was Lord, over it! There is absolutely no evidence in the bible, that would indicate that the Sabbath day, could be referred to as “the Lord’s day”. That only leaves us one more day, that is specifically mentioned by name in the bible, as being associated with Jesus. And that day is the first day of the week. Does the first day of the week, somehow “qualify” to be called, by God Himself, to be “the Lord’s day”? Let’s see what the bible says about that day. So then Jesus was resurrected, “early on the first day of the week”, and He first appeared to “Mary, THE Magdalene”. Now that’s pretty significant. Romans 8:29 tells us that Jesus is “the first-born among many brethren.” And Colossians 1:18 says that “He is the beginning, the first-born from the dead, so that he might have first place in everything!” And the day I which Jesus was “born from the dead” was the first day of the week. He was the “first-born”, on the “first day”, in order to have “first place”, in everything! Now that’s significant! What else happened on the first day of the week? Remember how Jesus was crucified and died on a Friday? But the scriptures never mention Friday as being significant. But the scriptures do mention, repeatedly, the significance of the death of Jesus; Not the day He died, but His very death itself. For example, the apostle Paul wrote, in 1 Corinthians 15, verse 3; “For I delivered to you, as of first importance, what I also received; That Christ died for our sins, according to the scriptures..” The significance of Christ’s death, cannot be overstated! How about the significance of the Lord’s supper? We’re told in 1 Corinthians 11:26; “For as often as you eat this bread, and drink this cup, you proclaim the Lord’s death until he comes!” We proclaim the Lord’s death! that’s pretty significant! And which day do we do that on? Acts 20, verse 7 tells us; “And on the FIRST of the week, when we came together to break bread..” The first day of the week, is “THE day” that God has chosen for His disciples to come together for the Lord’s supper, and to proclaim His death. What else? Well, Jesus not only was resurrected from the dead on the first day of the week, but He also appeared alive, for the first time, on that very same day. We already know that He appeared to Mary from Magdala, but Mathew chapter 24 tells us that there were other women present also, whom He appeared to (Mat 24, verse 10) and then that same day He appeared to two more of His disciples (verse 15) and then later that day, he appeared to all of His apostles along with other disciples (verses 33 thru 36). When was the next time that Jesus appeared to His disciple? John 20, verse 26 tells us; “And after eight days, again His disciples were inside, and Thomas with them; Jesus came, the doors having been shut, and stood in their midst, and said; Peace be with you.” So if you count the day that Jesus first appeared, which was a Sunday, then eight days would bring you back again to Sunday; Sunday, Monday, Tuesday, Wednesday, Thursday, Friday, Saturday, and Sunday; Eight days. I believe that’s the proper way to count the days, because when the scriptures say that Jesus was in the grave three days, the day He first went to the grave, is counted as the first day. Even though He was in the grave maybe only an hour of that day. Just like on Sunday, He wasn’t in the grave for a full day either. Friday, Saturday, and Sunday, were still the “three days” when Jesus was in the grave. What they we’re promised, is specified in verse 8; “But you shall receive power, when the Holy Spirit has come upon you..” And immediately after that, Jesus ascended back to heaven; Verse 9. The final first day of the week that we need to talk more about is the day of Pentecost. But we’re out of time for now. So, in our final lesson, we’ll discuss in a little more detail, the day of Pentecost, and then we’ll just recap a few of the most important points about the significance of the first day of the week.